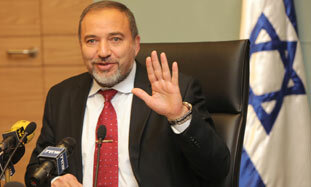 Foreign Minister Avigdor Liberman criticized the UN Security Council’s pressure on Israel Tuesday, noting that the Palestinian Authority’s (PA) demands to force Israel to withdraw from Judea and Samaria within a strict two-year timeline is part of “a political attack” on the Jewish state, fomented by the EU. Liberman not only called on the EU to stop fueling Palestinian fire, however; he also urged Israel to create its own solution. “The lack of an Israeli initiative deteriorates our position in the international arena, will harm our relations with our friends in the West and will not allow us to stand up for the things that matter to us,” he continued. Liberman then pushed his plan to form strategic ties with the “moderate Arab world” and withdraw from the “triangle area” of mostly Arab towns in northern Israel. “But even if at the moment there is no majority in the cabinet this proposal, we must take some initiative. Israel can not allow itself to be led – we must initiate and lead,” he concluded. Liberman has heavily promoted the idea of the “triangle swap” before, most recently earlier this year during the final stages of the last round of failed peace talks, in a plan that would extend the reach of a state of “Palestine” right into the center of coastal Israel. The swap, which Israel reportedly offered the US in talks in December with Prime Minister Binyamin Netanyahu’s support, refers to the area known as the Triangle in east-central Israel. The area includes the cities of Tayibe and Tira, in which about 300,000 Arab citizens live. He has also stated on multiple occasions that embracing the “moderate Arab world” is the plan for Israel’s security in the Middle East.